UPDATE: Thank you to anyone who might have prayed Tfor us - she slept ELEVEN STRAIGHT HOURS last night!!!!! She has done 6 and even 8 once but eleven??? Thank you! (I'm not trying to edit myself - I just know how many of you out there who are reading this who would give anything to have a baby - even one that doesn't sleep. And I will NEVER forget how that feels. So I just want you to know that at 2 a.m. - when I'm rocking her - God always prompts me to pray for you. And I hope when you have a baby (and you will) - that you will NEVER forget how it feels and pray for those who are still waiting). We changed her pack and play into a play pen in our living room but she really doesn't love playing in it. She's in it right now so I can type this quickly and do a few other quick things. But I don't have long. ha! Sounds yummy! I LOVE LOVE LOVE Paula Deen! This is a must try recipe! Thanks for sharing it with us! You're too cute... I know what it's like having no time. Try juggling twins @ almost 1yr old. :) Harper is so darling and growing sooo fast! I love reading your blog may God continue blessing your family. Anymore sweet babies to come?? It's okay to complain about no sleep- I feel like you always have to cover your bases. Anyone would complain about a major lack of sleep. See if your pedi will recommend a sleep book tomorrow. Ours recommended one that we loved and our 9 month old sleeps 11 hours straigh every night. It may just be her personality, but you need to get some sleep! I want that pot pie now..........yum. I use the Halo sleep sacks mainly for warmth, but when they're younger it also keeps them from standing (at least it worked for mine). It's just harder for them to get up with it on. Just a thought, but great for winter. Blessings! That Pot Pie looks so GOOD!! Like the photography of the plate too. Have you signed Harper up for the Gap Casting call? The photo at the top where you have it slightly colorized with pink would surely be a winner. I have my daughter signed up - so here is the link - in case you would like to put your little beauty in the contest! I hope Miss Harper gets to sleeping again, for your sake. It's very possible it's just her little teeth. Off to checkout the pot pie recipe...yumm! That pot pie looks amazing! I'm going to have to check that out...that Paula Deen has some great recipes, doesn't she?! Woohoo, Harper! Way to stand up for Jesus. It's so much fun to watch Harper grow. that harper is a fast learner! my baby has not started pulling up yet or crawling correctly (she pulls herself with her arms everywhere!). i'm sorry for the no sleep. i know that is so hard. Hey, most of us mothers know what its like to be tired, and sometimes even at wits end. If someone wants to get on you about it, who cares what they think.. its what they think that doesn't matter because they don't know. Everyone is entitled to a bad day, even you. Harper is sweet, and I hope tonight she sleeps for you! my almost 8 month old doesn't care to pay in his pack and play either! i just said the other day that the cold weather makes me want to cook and bake! there's nothing like comfort food! As always, Harper is precious! Love her CUTE outfit! It's okay to say you're tired.....especially if you're a mother with a child that doesn't love sleep:) I would definitely talk with your ped tomorrow...maybe he/she could offer some suggestions/solutions. The pot pie is delicous! I've made it! Here's hoping you get some GREAT sleep tonight! I love Harper's little outfit. We love chicken pot pie too. My SIL makes the best. In fact, I got a casserole dish especially for Hope's Chicken Pot Pie. I LOVE chicken pot pie - need to try Paula's recipe!!! I love her too! Hope Harper starts sleeping more for you!! Oh no, I hope it's her teeth and she's back to sleeping soon...that is exhausting! I also can not wait to make the ck pot pie, I have never made it, and it is one of Hubby's winter favorites! :) Thanks dear! All of my children had trouble sleeping when they were having developmental leaps (ie learning to stand) Hopefully she'll start sleeping better for you soon. I HAVE to try that pot pie, it looks so good! My little one went through the same phase of not sleeping around 9 months (she is 10 months now) and is back to sleeping through the night. Yeah! Hopefully that will end soon for you as well. Definitely get her ears checked because you don't want to mess with ear infections. It's okay to complain...really. We all complain about something. I'd certainly be complaining if I was not getting much sleep. You poor mama. I feel your pain. I love that you titled your post "stand up for Jesus" because that is what Harper is doing all of the time. That is so precious!! I love chicken pot pie, but I've never actually made it. That recipe sounds really easy. I might have to try it soon! Cold weather always reminds me of chili and warm apple pie. Yum! First, we have the same china - but mine has never had such delicious-looking chicken pot pie served on it before. Second, (we have an 8 year old daughter and almost 6 year old son) stick with your regular routine during this no-nap phase. More likely than not, it will pass. And, you will be glad not to have to re-introduce the idea of being in her crib during the day. She'll decide that crying is not worth it and look at books or something so that you can have a few minutes to relax and regroup. I agree about the weather making you want to cook and eat! Something comforting about fall/winter weather and food. I am all up for trying new recipes! I will be giving the chicken pot pie recipe a try. It looks delicious! sweet sweet Harper. And I am so so sorry if people say not nice things where you have to make it clear that you pray for those wanting a baby. I actually had a crazy lady call my house that reads my blog. I don't know why I have to always justify what I'm saying. You are such a good mommy Kelly! I wish we lived closer! I HEART HER! She is precious! I can't wait to see her for lunch next week, and you of course!!! I love Paula Dean! Thanks for the reciepe :0)! Hope Harper's appointment goes well tommorrow! I'm with you on the cold weather makes ya wanna cook and eat comfort food! I love chicken pot pie and will definitely have to try that recipe. I too have been finding myself cooking more lately I agree the cooler weather just calls for time in the kitchen. My daughter didn't care much for her play yard at first, either. She is slowly warming up to it, though...at least enough to allow me to do a few fast chores without having to worry about her. Hopefully Harper will do the same! I can't imagine how you begin to function with the little sleep that you get on a regular basis. I have a 5 yr. old, a 3 yr. old and infant twins. Praise God they are good sleepers or I wouldn't be here to write this. There are some days when I can bearly function, even after a fairly good nights sleep, however, God always gives me the strength to go on. They are precious sweet babies and will be gone before we know it. Is there any way that hubby can take over some nights to give you a break? I know you breast feed but can you offer a few bottles a couple of nights a week just to give you a little help? Hey! I just started reading your blog a couple of days ago and just love it (and your love for Jesus!) :) Also, that chicken pot pie looks amazing!! Might have to try that soon! Good luck with more sleep soon! Each time one of my children learned to pull up or walk they quit sleeping. Our pediatrician told us that the two are related. Harper is seeing the world from a different perspective now. She can STAND! Why in the world would she sleep when she can stand up and look around????!!! She'll get back to sleeping, then somewhere around 16-18 months she quit sleeping again and have a huge bout of separation anxiety, then you'll be good after that!! You are too sweet! I read your blog daily, and it upsets me so much for you to feel that you have to apologize or explain yourself for wishing you could rest!!!! I know there are THOSE people who criticize you every time you vent the teensiest bit about motherhood, but my goodness! Anyone who reads your blog regularly knows your heart and knows how much you treasure motherhood!! Not only how long it took you to get pregnant, but how close you came to losing that sweet girl in January. Anyway, I did not mean to get off on that. I just find it aggravating that people make you feel that you have to be apologetic for being exhausted!!! God Bless! I can't believe how big Harper is getting. She is so cute!! That pot pie you made looks so yummy. I love eating stuff like that when it gets cold and yucky outside. I wish my hubby liked chicken pot pie! He's a meat and potatoes kinda guy and not a casserole man. Talk about "comfort food"! Chicken pot pie is it! I've often read that babies have a hard time relaxing to sleep when they're trying to achieve a new milestone - like standing on her own or walking. Their little brains are so consumed with mastering the new task that they just can't do anything else. Just remember - this too shall pass. :) Hugs to you! so sorry about the sleep thing. the middle of the night can feel so long (and lonely and scary-- i always freak myself out in my house in the middle of the night) when your baby is crying. so exciting that she's pulling up, though. it's so amazing to see them grow and change right before your eyes, isn't it? the chicken pot pie looks SO YUMMY! bravo. i've been eating up a storm. not good for losing baby weight! It's pretty common that when little ones start doing really independent things like pulling themselves up they tend to not sleep well for a little while afterwards. Give her some time and she'll probably start sleeping like a champ. My daughter starting pulling herself up at 7 months and was walking by 9 months. during those times she didn't sleep well but once she got used to it, she was fine and back to her sleeping patterns. Yay for Harper almost walking!! I hope her dr appt goes well tomorrow! Sorry you're havin a hard time with the sleep thing. I hope it passes soon! But just because you're talking about not getting much sleep doesnt mean you dont appreciate your daughter! Anybody who thinks otherwise has their own issues girl! Cute Cute Cute! Before you know it, you'll be posting "Onward Christian Soldiers" as Harper walks!!! :) I'm going to try out your chicken pot pie recipe. I made one Monday night (Betty Crocker recipe, actually) and it was pretty dry!?!?! Might've been my fault, though. But I'm yearning for a juicy chicken pot pie!! Being a mom is hard work, even if it's the best work you've ever done! Since Harper had colic she is bound to have sleep problems. You've got to ask a professional and get some tips. Weissbluth or Ferber are both fantastic and usually highly recommended by pediatricians. Weissbluth has a whole section dedicated to colicky and formerly colicky babies. It is wonderful! There's no way we, mothers I mean, can know everything w/o some guidance. I bit the bullet and did it after my son didn't sleep all night by 6 months it is honestly the best thing I've ever done. We are all so much better rested, healthier, and happier. I don't really believe that babies will "grow out of it." I've met too many moms of 3 year olds that still don't sleep all night. You both deserve some much needed rest! Lots of babies have trouble sleeping with they learn a new skill? Especially pulling up, crawling and walking....maybe that's it?? Hope you get some sleep soon! I know it's rough but I also know what you mean about not complaining - I'm right there with ya! I'm sleep deprived and so grateful! I have wanted a baby for a while and when I get one, and she doesn't sleep...I WILL complain! You should too! Kelly, I know you don't know me but I have to tell you, our daughters are SOOOO much alike, and only 1 month apart in age. I can't tell you how many of our stories sound alike. My daughter refuses to nap and sleep lately too. I also remember what it was like to wish and pray for "problems" like this before, so thank you for helping me to count my blessings. Oh good, I was hoping you'd post a new recipe soon :) Thanks! And Paula Dean none the less. YUM. Oh Harper is getting so big. She's so adorable. Yummy! That pot pie looks so good. I am planning to try that recipe soon as it is still raining in Sweet Home Alabama! Harper's a doll! I just love this age. I have a little one who will be 1 next month, and I can't believe it! I love keeping up with your blog. She's adorable! That potpie looks super yummy. I love anything Paula Dean!!! Aww, hope Harper's ears are better so you both can start getting some sleep again. Kelly, take her off all dairy!!!! You just gave her cheese and now she won't sleep. She had double ear infections since you have been adding dairy/yogurt/cheese puffs. For the heck of it, remove all dairy and see what happens. Give it a week or two. But if dairy is bothering her, she can't verbalize. This happens to a lot of babies - it happened to mine. That's why I'm so passionate - these babies can't say 'Hey I feel horrible since I ate that", particularly if they have dairy at every meal. They don't have any time they don't feel bad after a while. Look back at her photos - those dark red circles under her eyes, those glassy eyes - those are "allergy" eyes. Since she isn't eating many different foods, it is one of those. If since she's eating cheese she has stopped sleeping - pick that to remove first. If dairy isn't it, then pick something else she loves and remove it for a week and see if she's better. If you keep a food diary of what she eats/drinks and then how she feels/acts/sleeps, you will figure it out. She already has a list of foods she is allergic to but not all foods show up on the testing. And if the doc said she had a "mild" allergy to something and you are giving it to her anyway, remove it for a week and see. Oh Kelly, I pray that Miss Harper decides that sleep really is important again! My Ella never really boycotted naps, but she didn't sleep through the night until she was 15 months old. She was just spoiled b/c I ran in anytime she made a peep so that she wouldn't wake her sister, but we had to put a stop to that. After a few weeks of a lot of crying from both of us ;) and some tough love, she finally realized that her Mommy wasn't abandoning her. So, hopefully you won't go through this too. I bet Harper is just so excited with her new standing trick that she can't waste anytime sleeping and not practicing! I can totally relate to what you're going through with Harper standing up in her crib all night long instead of sleeping! My daughter Nora did that for about a month straight after she learned to pull up. I'd wake up to her crying her little head off and go into her room to find her standing in her crib wailing. I think she stood up in a half-asleep state, then woke up standing and didn't know how to let go and lay back down! It's kinda funny in hind sight, but it was exhausting at the time! Just want to encourage you that this difficult phase will end! My pediatrician said that each time a baby learns something new (like pulling up), they want to practice it as much as possible - even in the middle of the night, which disrupts their sleep...and yours! YOu should check out the book "Touchpoints" by T. Berry Brazelton. It talks about how kids go through times of almost regressing a littl ebit ( i.e. not sleeping at night, tantrums, fussy etc.) just before they master a new developmental task ( rolling, sitting, standing, walking, talking). I have found it to be very helpful! Love watching Harper grow and love your blog! Hello! I have been wanting to tell you about something I read in our newspaper about eczema. We have a Ask the Doctor. Any way a women wrote in about her daughter had eczema and she had read somewhere to take all purpose flour and put it in a black kettle or a flat pan and put it in the oven until brown. After it cools you put it on the eczema. She said she did it a few times and it was gone. Thought well, what the heck I don't think it would hurt anything. I would love to email you-but cannot find one here(and have not for a while.) I love your blog-and enjoy watching your precious blessing grow. I believe you are one of the kinder bloggers out here and one can really see and feel your heart for Jesus in your words. I know you write a lot about how you pray for many families, especially having a heart for those who have not be able to experience having a child. That is awesome, and like you-pray that God will answer those prayers. Likewise though, when we pray, we have to remember that God is sovereign, sometimes he says yes;other times no. When we say things like "and you will" in reference to others who are trying to conceive, in trying to encourage others that are struggling, the words ring hollow to those that are still suffering infertility-even when said with the best intentions. I write from experience-as I do have two children, but never was able to carry another to term. three of our little ones are in heaven as a result. It's been a long time ago(though a mother never forgets), so I am fine...but the words you spoke reminded me of that period of time when we were trying - and had to eventually listen to God's voice as he knew what was better for us than to allow the other three children to be born to us. In heaven all will be complete-and I rest in that peace. Thanks for listening-you are an encouragement among many bloggers out here-young and old-and it's nice to see parents really trying to raise their families up to be pleasing to God. I can not wait to have my own place with my own kitchen so I can try out all the recipes I have saved on my computer! I just LOVE Paula Dean! And I hope and pray that Harper starts to sleep better soon! And I just think you're the biggest doll for thinking of those who are waiting for their bunble of joys. God is truly your friend. Thank you for being such an awesome example of what a Christian is suppose to be! Kelly, when I am up in the middle of the night I am always thinkign of the other mommy's savourign such moments under the same sky. You have reminded me of all the wonderful women hoping to be mommies, I too will use those moments to offer up a similar prayer. My son did that when he became more mobile. Hang in there! I went ahead and kept putting him in his crib at the same time, for an hour, every day. Even if he cried the whole time, we stuck with it and before too long, he would just hang out and play with some crib toys. It was quiet time for the both of us! :o) Just hang in there, you'll figure out what works for you guys. It can be different for everyone! I think now that Harper has experienced cheese, she just CANNOT rest until she reaches her ultimate food goal: The Cake Ball. Oh my Harper is growing up!!! What a little beauty she is. That recipe is soooo good! I cook it all the time for my family b/c I usually can get two meals out of it. It is also good b/c it has a lot of veggies in it! I have started cooking your poppyseed chicken & my husband loves it! Great meal as well! It's pretty common for babies not to sleep right after they learn a new skill. It's like they have to practice over and over and over and get it just right. In a week or so I'm sure she'll be sleeping good again. I'm the same when it comes to cold weather. Tonight I tried a new recipe off Allrecipes.com. It's Cheeseburger Meatloaf and it turned out SO GOOD. Yummy! Cold weather makes me want to cook too... more specifically, bake. Which is what I did when it was snowing here in Colorado on Saturday. I'm gonna have to try that pot pie! its looks yummy!! and Harper is growing up so fast!! Brody went through a rough phase around 9-10 months where he didn't want to sleep. Our pediatrician told me it was totally normal phase for that age! Hang in there. I know you are so tired but she will get back to sleeping normal again soon! LOL, I was just telling someone the exact same thing today...about when the weather turns cool & rainy, I want to cook! I made Chicken Pot Pie on Monday night & I'm definitely going to try the Paula Deen version, thanks! I hope Harper starts sleeping better for you soon. I know how hard it can be to be tired. I often have wished that we just really didn't need sleep. I would love to just be able to rock my son all night long but, we need sleep to be good moms! Like you, I also pray for the ladies out there that don't have their precious babies yet. It will happen for them! I love your honesty and how you haven't forgotten the feeling of longing for a baby. I have no doubt the feeling will always be there but some people try to supress it instead of embracing the journey. It's a hard thing to do but I love your approach, being a Mom of 1 who is trying for #2, I thank you for that! did you see Paula Deans MTV Cribs episode? It was hilarious! Speaking of those still waiting for children, I remember being pregnant with my fourth and last. It was unplanned and I was very upset. My third baby was less than four months old!! I wouldn't even take a pregnancy test. One day when I was especially upset, God reminded me that I was very blessed. Being convicted of complaining, I asked God to forgive me and did not complain again. They had to take my son by c-section because he was over 10 pounds. It was an iffy call and a long story. Had I had the doctor I had planned to have, he would not have taken Matt but would have let me try to have him naturally. The cord was doubled around Matt's neck and there were two knots in it. If I had tried to have him, I probably would have lost him. My doctor kept saying over and over, "We made the right decision, we made the right decision." In the labor room next to me having her fifth at the same time was a lady who lost her baby. God brought home to that day how blessed I was. I could not imagine going through that pain. I have never forgotten that lesson. So, yes, I agree that we should all be thankful when our babies/children are alive and healthy. I love Chix Pot Pie, and I'm all for an easy version! I'll have to try hers! Thanks for the suggestion! A lot of times, with both my girls, they wouldn't sleep when they were working on a new skill - ex: pulling up, about to walk, etc. Yay for sleep!! I've been in the cooking mood lately, too! I'll have to try this one! 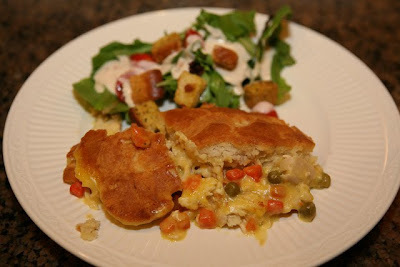 I LOVE chicken pot pies.. can't wait to see the recipe you used!! I've tried several different ones. Amazing how fast those little ones can get around. Chicken pot pie? I think you have just made my boyfriend's day! Have you done any sleep training with Harper? I found that my kids crave a schedule and are happier and more rested when we follow it. so very happy to hear this morning that she slept 11 hours..i know you needed it mama! you know, my son started sleeping 12 hours straight (he was pretty much like Harper up until that age, just didn't "need" sleep) when he turned 9 months! maybe things are going to get better with her sleeping! i pray they do! You're sweet to always think of the feelings of other people when very often, they do not do likewise. Your circumstances and feelings are your own. Another person's unfortunate (or fortunate)situation does not change yours! :) Glad you're catching up on rest...if that's possible! Yea for 11 hours! I hope you slept that long too- your body gets in such a pattern that I know it took me forever to sleep past 4 AM after weeks of feeding at that time. Once upon a time I too had a baby that didn't want to sleep... EVER! At the time my husband was in Iraq and I was dealing with it all alone and needed sleep so bad! Someone at my church gave me a book... Solve Your Childs Sleep Problems, by Richard Ferber, M.D. I was at my wits end so I read the book and it changed my life... seriously! I hope Harper keeps sleeping! That is one of our favorite recipes for winter. Isn't that biscuit on top the best?!! I myself just tried that chicken pot pie recipe!! I am not one for leftovers, but this recipe I could eat over and over again! I also wanted to say thank you for the reminder of praying over these women, whether they are waiting for God to bless their womb, or have had the loss of a child. This is when we find our hearts postured towards God:)Although tough, it really is a beautiful thing! I think often when babies learn a new gross motor skill they have a hard time sleeping. At least that's how my kids have been. Did you see the cover of Sports Illustrated? I didn't read the article, but the headline was something about SEC... why it's the toughest football conference or something like that. Ha! There ya go, your loyalty is verified by SI!! Kelly, nice play on words with the title of this blog. Consequently, the song has been stuck in my head since I read it this morning. Having grown up in a traditional Baptist church, the words to these songs often creep back from the depths of my memory. This, today, has reminded me to keep my mind on things eternal and to lean only on the strength of Jesus as I make decisions regarding my career in the coming weeks. Thank you for your simple and inadvertent reminder. It tickles me to see Harper developing so beautifully and right on as if she is reading the Mommy books! :) HUGS! Woohoo! My 14 month old slept 9 hours straight last night, and I am thrilled:) Way to go, Harper! you are so sweet Kelly!